Offering you a complete choice of products which include single stage watering vacuum pump and single stage water ring vacuum pump. Power 3 H.P. to 120 H.P. We are one of the most commendable enterprise engaged in exporting and supplying high-quality Single Stage Watering Vacuum Pump. 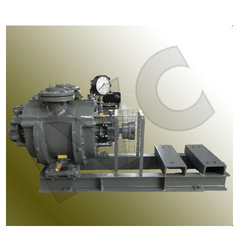 Our offered pumps are widely accepted in the market for their high sturdiness and suction capacity with fine accuracy. Moreover, these pumps employ single stage water ring operationality which makes them ideal for use in steam turbine generator. We have with us wide specifications of these pumps for supply to customers at equitable price range. Backed by an advanced manufacturing facility, we are engaged in offering a huge array of Single Stage Water Ring Vacuum Pump. These pumps are manufactured using advance technology and beat quality raw material. These precisely engineered products are available with us at market leading prices. Looking for Single Stage Watering Vacuum Pump ?